Every year we Americans have a three day weekend, perfectly timed three weeks into a new year that is probably already beating us up. This is a day to celebrate Dr. Martin Luther King, a man who gave his life for freedoms many of us enjoy now in the 21st Century. Do not be mistaken: this day is also a reminder of how far we still have to go. It doesn't matter your color or creed, we are still all affected by those who have freedoms and those who do not. If you are in the mood to celebrate this day, there are dozens of events going on around the Bay Area. Most of them will include music, lots of music. Gospel, jazz, R&B, rock and roll. Anything having to do with MLK usually gets me emotional, gospel music does as well. So I'd better get ready for some waterworks. 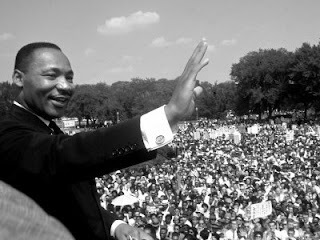 If you are not in the Bay Area, just do a google search for Martin Luther King and your area and you'll find something. Or check this website.